I’m not by any far cry a bookworm, but I do try to see if I can score worthy bargain books whenever I can. Cheapest, interesting book I bought was an Asimov-edited sci-fi short story compilation for four pesos. 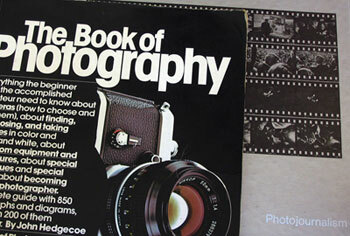 John Hedgecoe, whose name is quite familiar whenever I do browse the web for any photo-books, came out with The Book of Photography in 1976. Just this weekend, I purhcased a 1990 edition for Php220 (click here for the new, 2005 version). This is easily the best how-to book photography book I’ve paid for, that goes through the basics (cameras, composition, technique), old-school style, which I am so enamored with. The accompanying pictures have a fine-art slant to it, definitely refreshing from the standard commercial and nature photography more often seen. A rather more expensive buy (a little too expensive for a bargain book, whose cost I’ve erased from memory by inking the price tag with permanent black marker) is a Time-Life book on Photojournalism, reprinted in 1976. The sheer quality of the photographs included are eye-popping, and some downright disturbing. I’d always skip the page where some lucky photographer caught someone, who committed suicide by jumping from a building, about 8 feet above-ground, just before impact. As for content, the chapter on the History of “Covering the News” is a damn good read, from how 19th century journalism considered it in very poor taste to include news pictures in print, to how the press wanted woodcut drawings instead of realistic photographs.